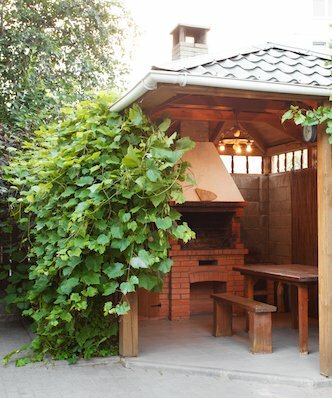 This good looking kit has the versatility and fun factor in spades and will look fantastic in any garden. 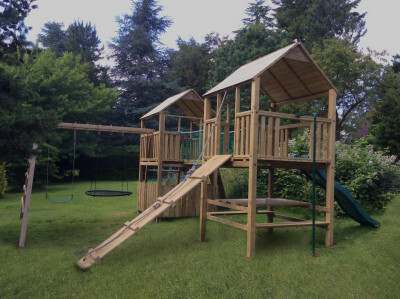 In this double tower with slide combination, you have loads of fun built in, but each play tower has its own individual style. Tower one has a steep access ramp with helpful supporting rope for anyone unfortunate to lose their momentum. With a great wavy slide on the opposite side for a quick getaway. For an even speedier escape, there’s a fireman’s pole for those in a real hurry! Or its a sprint across the ‘shark infested waters’ via the netting enclosed bridge to the other tower. One thing our equipment allows is the firing up of imagination for your children. Tower two, if anything, has even more fun that tower one and is more of a challenge. 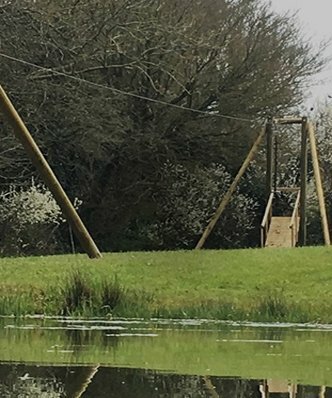 Access via the bridge is plain sailing compared to the three other methods; Up a steep climbing wall or the super wobbly cargo net, or for the more simian like children, via the monkey bars. 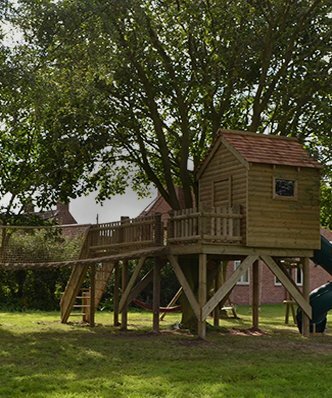 The platform provides 360 degree views of the garden – perfect for spying on pesky parents or the local wildlife. Below the platform, there’s a cool enclosed den-like space for hatching lots of plans or for covert picnics. 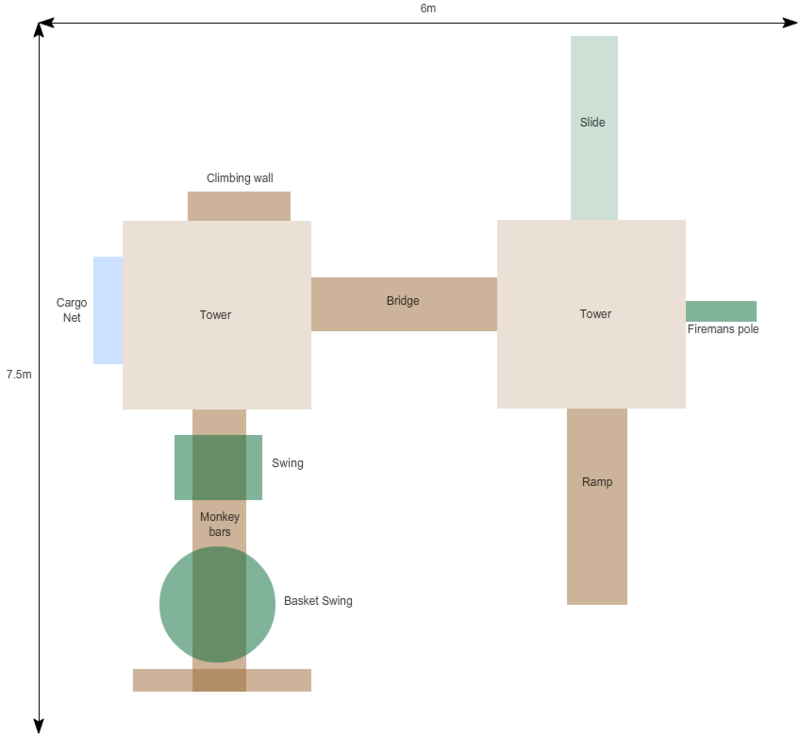 The last piece of this jigsaw is the swing set hanging from the monkey bars. In this instance, it’s a nest swing, which is probably the most social way of hanging out with mates and a sling swing, which wraps around the body. Capping it all off is a sturdy A frame, for kids who still want to climb some more! 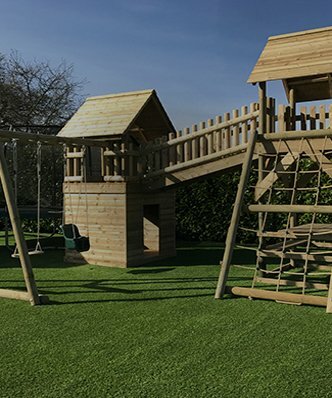 The play equipment is made from good quality, treated square timbers and is fully guaranteed for a 10 year period. Although is likely to last longer that that. With that kind of longevity, this frame represents excellent value for money – but to be honest, what a price for a happy, energetic and imaginative childhood.